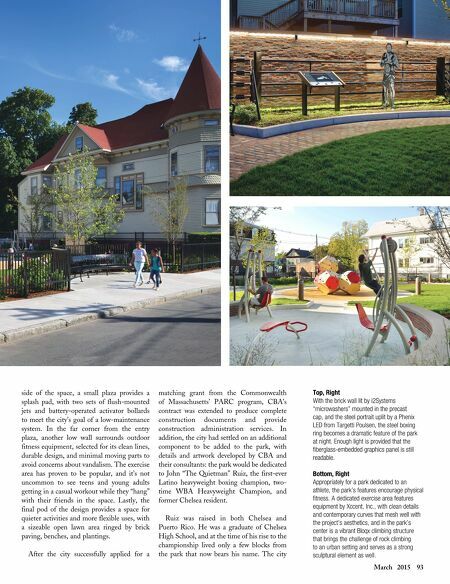 March 2015 93 side of the space, a small plaza provides a splash pad, with two sets of flush-mounted jets and battery-operated activator bollards to meet the city's goal of a low-maintenance system. In the far corner from the entry plaza, another low wall surrounds outdoor fitness equipment, selected for its clean lines, durable design, and minimal moving parts to avoid concerns about vandalism. The exercise area has proven to be popular, and it's not uncommon to see teens and young adults getting in a casual workout while they "hang" with their friends in the space. Lastly, the final pod of the design provides a space for quieter activities and more flexible uses, with a sizeable open lawn area ringed by brick paving, benches, and plantings. After the city successfully applied for a matching grant from the Commonwealth of Massachusetts' PARC program, CBA's contract was extended to produce complete construction documents and provide construction administration services. 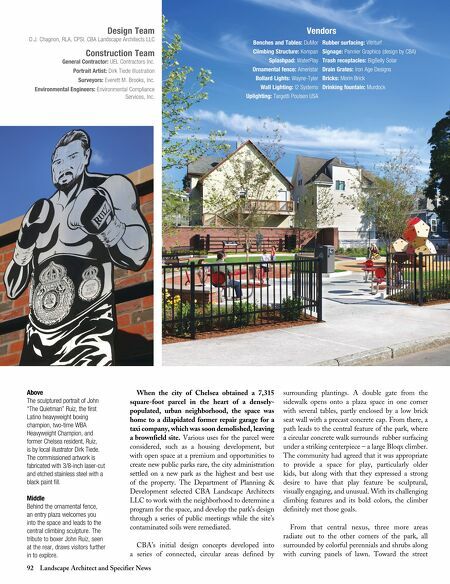 In addition, the city had settled on an additional component to be added to the park, with details and artwork developed by CBA and their consultants: the park would be dedicated to John "The Quietman" Ruiz, the first-ever Latino heavyweight boxing champion, two- time WBA Heavyweight Champion, and former Chelsea resident. Ruiz was raised in both Chelsea and Puerto Rico. He was a graduate of Chelsea High School, and at the time of his rise to the championship lived only a few blocks from the park that now bears his name. The city Top, Right With the brick wall lit by i2systems "microwashers" mounted in the precast cap, and the steel portrait uplit by a Phenix LeD from targetti Poulsen, the steel boxing ring becomes a dramatic feature of the park at night. enough light is provided that the fiberglass-embedded graphics panel is still readable. Bottom, Right Appropriately for a park dedicated to an athlete, the park's features encourage physical fitness. A dedicated exercise area features equipment by Xccent, inc., with clean details and contemporary curves that mesh well with the project's aesthetics, and in the park's center is a vibrant Bloqx climbing structure that brings the challenge of rock climbing to an urban setting and serves as a strong sculptural element as well.